Despite working with arranger Marty Paich regularly for seven years at Reprise, Sammy Davis, Jr. only released four albums on which Paich was the sole arranger. 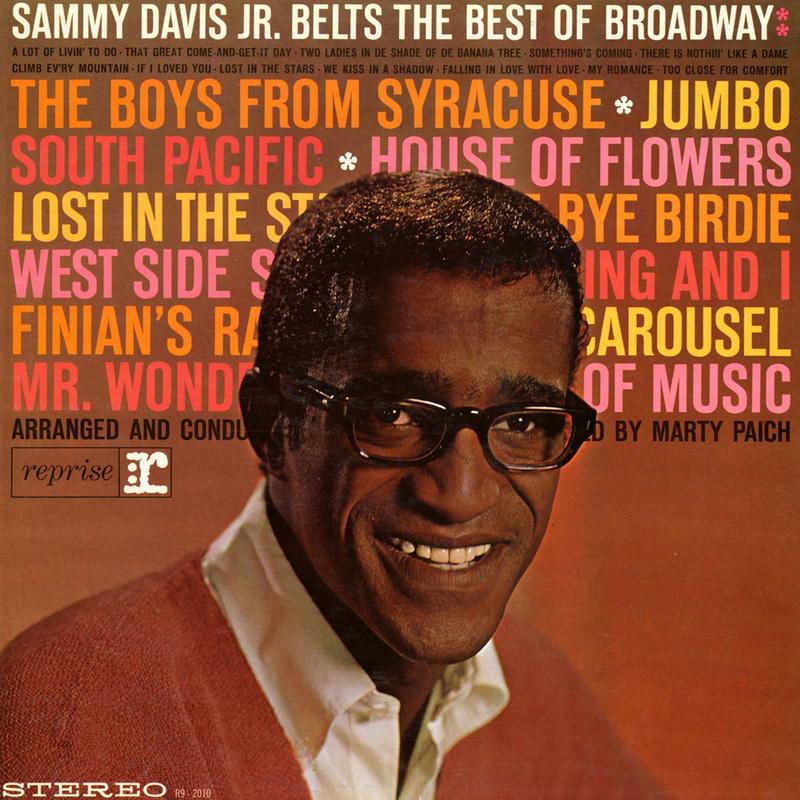 Sammy Davis, Jr. Belts The Best Of Broadway is the first and foremost of these (two of the others were specialty projects: one an album of songs written by Mel Tormé in 1964, and another featuring music from the film Doctor Dolittle in 1967). Paich arranged the vast majority of the material Sammy recorded for Reprise throughout 1961 and 1962, and he arranged for orchestras of varying sizes. Davis had worked with Paich’s famous 10-man Dek-Tette on The Wham Of Sam, but even when paired with a larger group (as he is for much of this album), Paich always managed to infuse Sammy’s arrangements with a fresh and vibrant jazz feeling. One session in late July 1961 proved a slight departure from this – it featured four notable show-stoppers with full orchestral backing including heavy strings and choral support: “Climb Every Mountain”, “If I Loved You”, “We Kiss In A Shadow” and “Lost In The Stars”. Paich cultivated a reputation in the industry for stellar work with strings (he was often hired to ‘sweeten’ the work of other arrangers) and you can find this talent in clear evidence here. The Reprise marketing did not lie – this album does indeed contain the ‘best of Broadway’: songs from Rodgers and Hammerstein classics The King and I, The Sound of Music, Carousel, and South Pacific all appear, as do songs from West Side Story, Bye Bye Birdie, and Finian’s Rainbow. 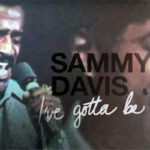 Where Sammy Davis, Jr’s singer-entertainer contemporaries were mining the Great American Songbook (a significant proportion of which admittedly originated on Broadway), Sammy was always mining The Great White Way for material. Three years away from returning to the stage himself, he was open to recording songs that couldn’t necessarily be boiled down to a generic love story. 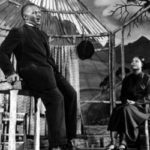 Sammy was a performer, and numbers like “Two Ladies In De Shade Of De Banana Tree”, “That Great Come-And-Get-It Day” and “There Is Nothing Like A Dame” need to be performed, not just sung; well, Sammy’s your man. Sammy had been belting the best of Broadway since his Decca days, and he would continue for the remainder of his career. A Lot Of Livin’ To Do: Everything about this recording is brilliant: the burst of excitement in its first few bars, the melody and lyrics from Bye Bye Birdie by Sammy’s future Golden Boy collaborators Charles Strouse and Lee Adams, the finger-snapping cool of Marty Paich’s arrangement, the calibre of the musicians and the crispness of the solos, Sammy’s impeccable sense of timing, and his effortless panache. Too Close For Comfort: Sammy introduced this standard in his 1956 musical Mr. Wonderful. Paich had already arranged it for Mel Tormé to sing in his seminal 1960 album for Verve Swings Shubert Alley, so it’s interesting that Davis would choose it two years later; perhaps an attempt to reclaim the song for himself! Marty duly delivers a second arrangement that is totally different from Tormé’s and gives breathing room for some Sammy improvisation toward the end. Two Ladies In De Shade Of The Banana Tree: The only cut from this album never to make an appearance on CD. It is from the 1954 Broadway musical House of Flowers, which was based on the short story by Truman Capote about two competing Haitian bordellos. Producer Saint Subber convinced Capote to work on the book and lyrics with Harold Arlen, but it bombed and ended up being Capote’s only musical. For reasons only known to Reprise Records at the time, ten of the twelve cuts on Belts The Best Of Broadway were repeated in future Sammy Reprise releases (five on 1962’s What Kind Of Fool Am I, and four on 1963’s As Long As She Needs Me). 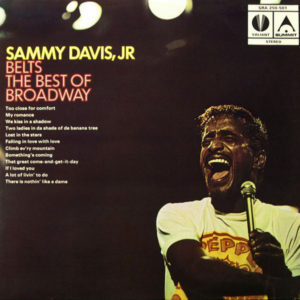 For this reason Collector’s Choice music declined to reissue Belts The Best Of Broadway when they released Sammy’s entire Reprise catalog on CD in the mid-2000s. Of the remaining two cuts, “That Great Come-And-Get-It Day” was included on Reprise’s Musical Repertory Theatre collection (which was released on CD in 2000), and “Two Ladies In De Shade of the Banana Tree” was left having never been released on a licensed CD. An unlicensed CD was released in 2017 which contains all the tracks from this album, and the album itself is now available for digital download (links at the top of the page). The album was reissued on LP in 1970 in the UK and Australia with this very 70s-Sammy cover. 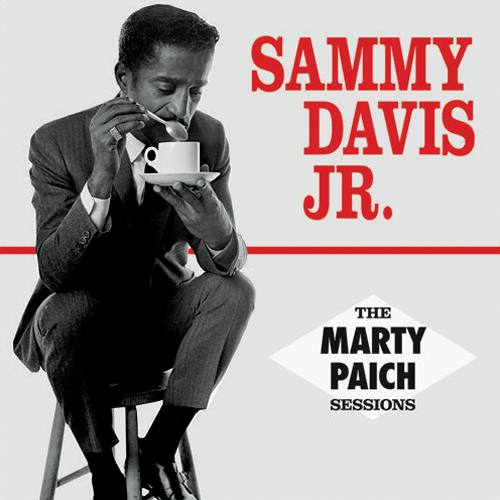 A 2-CD compilation focussing on Sammy’s early recordings on Reprise with Paich. It includes all tracks from Belts The Best Of Broadway.